Times are hard in the mountain city of Fellsmarch. Reformed thief Han Alister will do almost anything to eke out a living for his family. The only thing of value he has is something he can't sell - the thick silver cuffs he's worn since birth. They're clearly magicked - as he grows, they grow, and he's never been able to get them off. The Seven Realms tremble when the lives of Han and Raisa collide, fanning the flames of the smoldering war between clans and wizards. 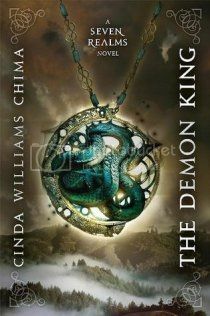 After how much I loved Cinda Williams Chima’s Warrior Heir series, I was incredibly surprised at how long I waited to try The Demon King. I actually waited until the ENTIRE SERIES was out, you guys. No torturous wait between books – I can read them as fast or as slow as I want! Unfortunately, though, reading Demon King didn’t inspire that “Gotta have the next book NOW” feeling quite as much as I’d hoped. I know there are many of you out there who love this series, and honestly, I can see why. It has all the elements of a good story – a repressed princess who wants to learn to be a better ruler instead of learning embroidery, a street lord determined to reform himself and a plot that could tear down a whole kingdom. I generally love those kinds of books. The thing is, I had a lot of trouble getting into it. The first chapters are incredibly confusing and kind of slow – I remember having gotten the book out and started it once before, only to have to return it when it came due because I hadn’t managed more than 100 pages or so. There are lots of characters and cultures thrown at you, but that by itself isn’t the problem. The problem comes when I’m 100 pages in and the main character, Han, who I have assumed thus far was part of one of the tribes/clans where he was first introduced, is suddenly revealed as a street lord in some city. I was so surprised that I debated going back to start the book over again with that in mind. I couldn’t make it make sense with what I’d been told about the character so far. Luckily the storyline of the other main character, Raisa, isn’t nearly as confusing. Sure there’s lots of courtiers’ names being thrown at you, but nobody drastically changes who they are halfway through. The thing is, Raisa’s story reminded me a lot of Bitterblue, one of my favorite novels of last year. This could be a good thing – but the whole time I was thinking to myself “Bitterblue did that… and, to me, it did it better.” Bitterblue was so out-of-this-world PERFECT for me that it’s very difficult for another book with similar elements to measure up. I kind of wish I’d read The Demon King earlier, because then I might have liked it more, since I wouldn’t be comparing it to one of my all time favorite novels. At this point, I’m not sure I’d recommend The Demon King to friends, just because I have so many other books I’d recommend first. At the same time, I’m certainly not advising against reading it, and I will probably eventually read the rest of the series myself. It’s kind of a preference thing – if you can read it and not compare it to other books, and are okay with paradigm shifts mid-book, then go for it! If not, this may not be the book for you. I’ve definitely heard about this series, but I don’t know if I want to invest the time in reading it. It’s hard for me to read fantasy novels back to back and since I’m still working on The Lumatere Chronicles AND Game of Thrones, I may have to give this a pass for now.